What Is The Best Home Beer Brewing Kit? On my 21st birthday, my father and I went down to the local market and spent some time looking at the vast amount of craft beers. Eventually, we settled on Goose Island’s Nut Brown Pale Ale. I’ll never forget. We had never tried it before but, little did I know, this is where my passion for craft beer, wine making, and brewing began. I loved it so much I immediately thought to myself. How can I make something like this? As it turns out, it isn’t that difficult. Whether you have a hops mouth or enjoy nutty nuances, you may have also entertained the idea of becoming one of the craft brewers. These kits have made this very easy to do out of the comfort of your own home. They’re perfect for brewers from beginner to advanced. 11 What’s The Best Beer Making Kit? #3 - Northern Brewer Brew. Share. Enjoy. There are many different craft beer making kits. Some of them are tailored for the beginner, and some are best suited for experienced brewers. It’s important to know which is which. To make beer at home as simple as possible, we have put together a list of some of the best beer kits and highlighted the pros and cons of each to help you find the best one for your needs. See what best fits your needs as a beginner or advanced brewer as we look into the best home brew kits as of today. Brewery in a Box put this together with the highest quality products with the brewers in mind. These kits contain everything you need for quick, clean, and accurate execution of your craft beer premium and hops. Though it’s a starter kit, it doesn’t really do this setup justice. This home brew kit is excellent for beginners and has equipment an advanced brewer would need as well. It comes with 2 carboys, bung and airlock, auto-siphon, bottling bucket and spigot, 2 adhesive thermometers, a full set of cleaning gear and much more. The only things not included are a kettle and beer bottles. Also included are an instructional DVD guide and Chinook IPA beer recipe kits. This is perfect for any newbie or as a gift to someone looking to up their game in beer homebrewing. This is truly one of the highest quality beer kits on the market. 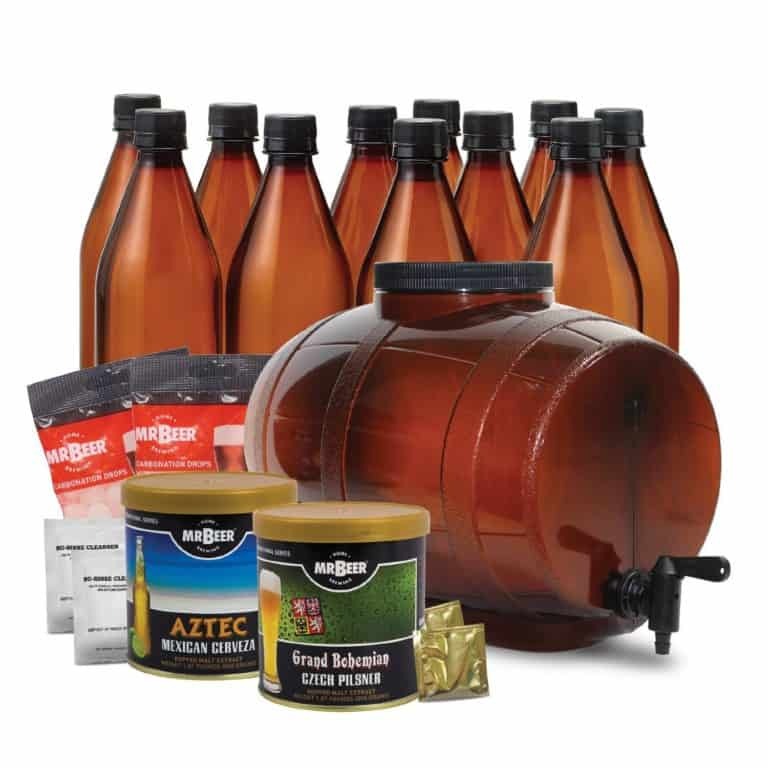 With the supplies you get in this, this setup will help you make excellent ales and brews for years to come. If you have never brewed before, don’t feel intimidated, this product makes it easy and really affordable. The Mr. Beer kits service about everything you need to make your first IPA beer. Aside from a few things you most likely already have in your kitchen, these beer kits you can start making beer today. It comes with a fermenter, 11 25 oz. reusable beer bottles, yeast, carbonation tablets, and two different extracts so you can make two different beers at home. One extract is the Grand Bohemian Czech Pilsner, and the other is the Aztec Mexican Cerveza extract. The only additional thing you need is a large pot, sanitizer and thermometer to measure your wort’s temperature (see review here). With this beer home brewing kit, you can make up to two gallons of hops per small batch with other ingredients like hops, yeast, and grains. You can also test your carbonation and fermentation level for optimum drinkability. These beer brewing kits make the beer process and system so easy you will be wondering why you didn’t start sooner. It won’t be long until you’ll be able to share your liquid goodness with your friends. This homebrewing starter kit is a brewer’s best friend. It is one of the most complete packages on the market. You will literally be able to begin brewing craft beer the day you pick one up. 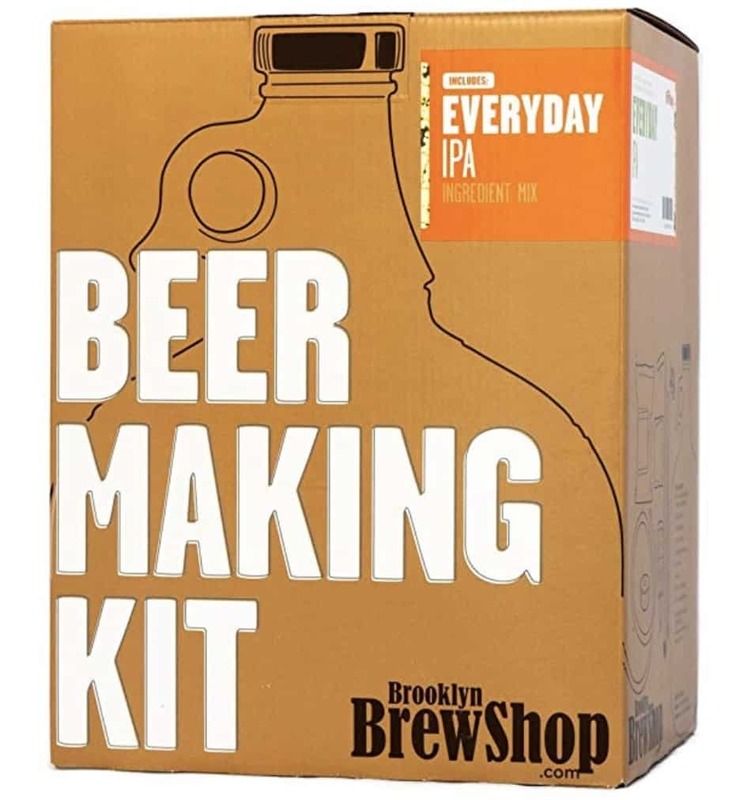 This home brewery kit not only comes with all of the necessary brewing equipment, accessories and tools required to make a small batch of beer or even gallons of beer, but it also comes with the ingredients and IPA beer recipe kits for an amber ale (malt extract, grains, and hops included). 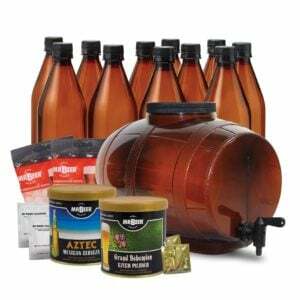 This brewing kit includes amber ale ingredients also come with foolproof instructions which is perfect for beginners who are looking to learn. This brewing kit even comes with a kettle and spoon. This largely outweighs the fact that its secondary fermenter is plastic rather than glass. 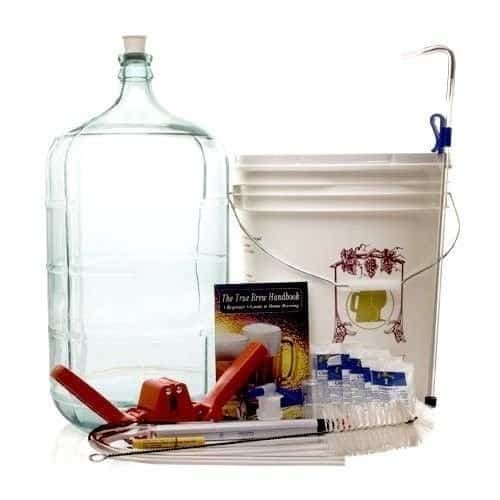 This home brewery kit is a great option. Honestly, the only thing you will need to complete the fermentation and brewing process and system is a set of bottles. The set even comes with the bottle caps. I know right!? You’ll want to add this home brew kit to your shopping list. With this product, you’ll be able please family and friends a month from now by sharing with the results. Now that’s sign you’re a great friend. 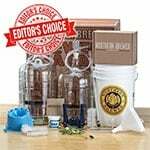 Whether you have several original recipes in mind or plan on brewing a clone, this home brew kit is going to get you the results you are looking for. This kit includes ease of use and is put together with quality products. It comes with complete easy-to-read instructions guiding you through the home brew setup as well as the entire beer making process, system, and service. 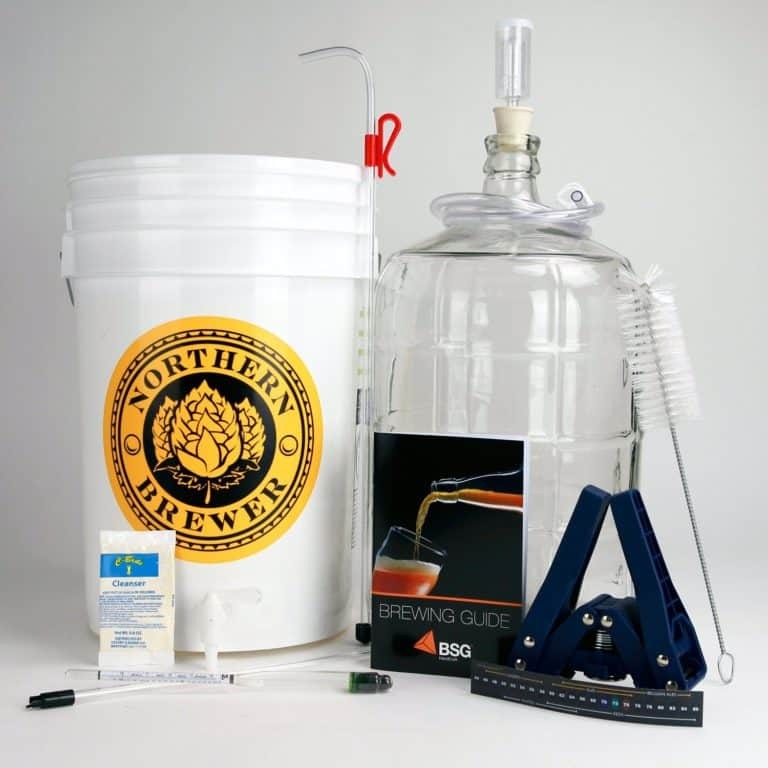 This brewing beer setup includes all of the necessary brewing equipment to create, ferment, and bottle your amber ale. It includes cleaning equipment, accessories, primary fermenter, secondary fermenter, a three-piece airlock, and more. The only thing this brewing setup doesn’t have is a kettle and thermometer. 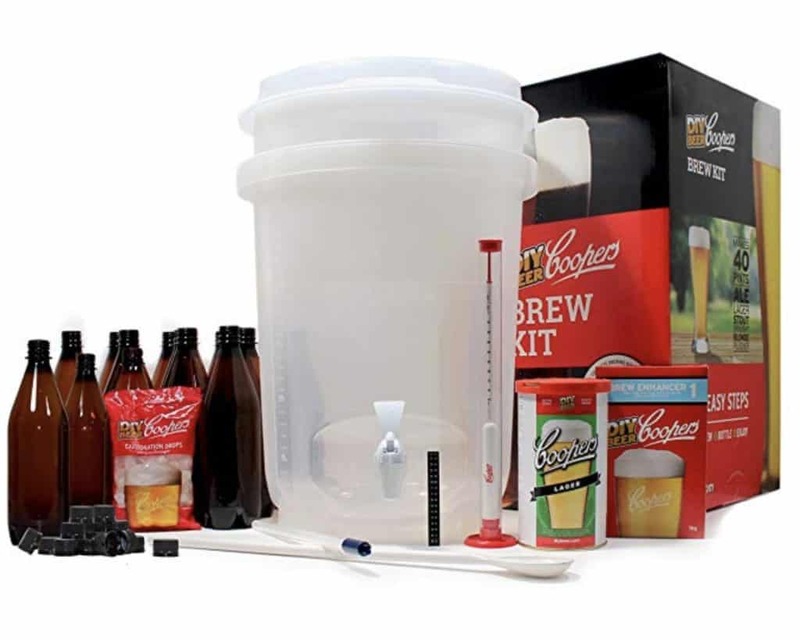 If you feel confident enough to start your own brews and are ready to jump right in, this small batch brewing kit will get you started. This beer brewing kits includes all the necessary tools and brewing equipment and accessories (especially for the fermentation process and system), and comes with easy to follow instructions. This homebrewing starter kit comes with a primary and secondary fermenter. It even comes with a hydrometer to measure the alcohol in your batch and a bottling spigot with capper to bottle your own brews. This can be used over and over again and also comes with the necessary tools to clean all your brewing equipment and accessories. The only addition that you will need is a recipe brew kit or one of your own! Monster Brew Home Brewing Supplies is an American online store that is dedicated to bringing quality brewing tools, so you know you’re getting something of high value. Their company is updated with new products regularly (with great deals) and shipping is not too bad. So if you’re looking for new goods, order from them. Or view what they have in stock. For anyone new to beer making and on a tight budget, this is a pretty good solution to get. You’ll receive the most important pieces of equipment, and as long as you have a kitchen and large pot to boil up the mash, then you’re in business. The fermenter is large enough for 1 gallon of wort, but keep in mind that once you strain and filter the finished product, you won’t have a full gallon of beer. The online reviews from customers are pretty positive, especially highlighting the easy to follow video instructions. For small, occasional batches, this is a good option that makes a nice gift for father’s day as well. If you want to make larger batches without investing in very expensive equipment, then this Coopers kit is a good choice to make. It has pretty much everything you need for creating your first batch, as long as you have a way to heat up a large enough volume of mash. A kettle is not included, and you’ll probably have to invest in a large enough pot and gas burner to heat up 6 gallons. Or you could make a smaller batch, but where’s the fun in that? What a lot of reviewers highlight is that the bottling valve is quite convenient and saves some time. Consider what is going to best serve your needs and how much money you are willing to invest. You may want to start small and add additional tools as the need arises. Or you may already have some things are just looking to expand your current setup. Or maybe you don’t want to search for each piece individually and are ready to jump in, get your hands dirty, and go for the gusto! Now, there’s really no excuse for you not to create a delicious small batch of liquid goodness. These kits can produce literally any style of beer batch from pale ale to dry stout or hops depending on the available ingredients like malt extract, yeast, or hops. Heck, you could probably create coffee and cider with these beer kits (most likely not). Pair your crafted IPA beer at home with some food and you have one hell of a combo. 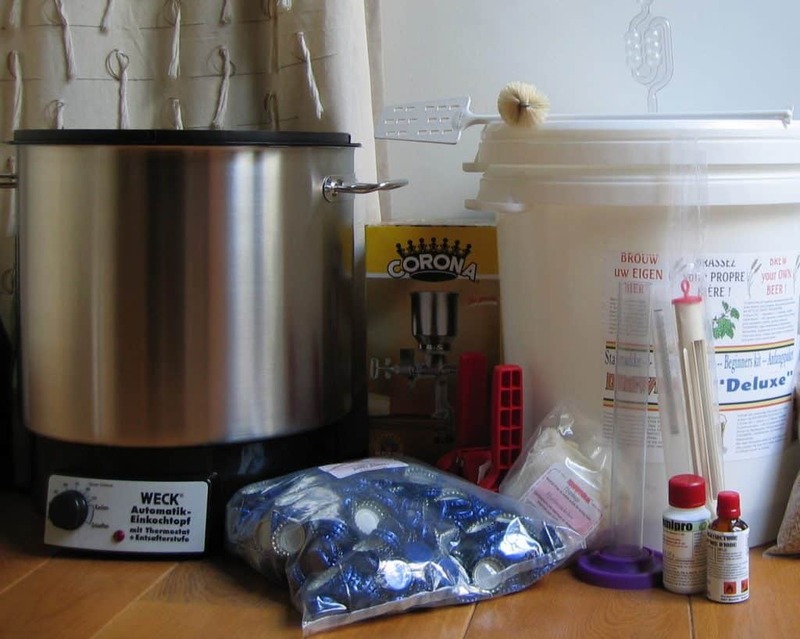 The following items are essentials for every home brewing kit – these are the must-have items. Some items are usually free and are included in your brew kit. 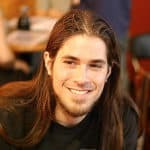 No matter if you’re a beginner or advanced brewer, you should aim to get all these items as soon as you can. It will make your life a whole lot easier. These accessories are nice-to-have products for beer making kits, but they aren’t have-to-haves. In other words, it is possible to get by without them, but if you do get them, they can significantly assist you in the brewing process and system. If you want transition from a beginner to an advanced brewer, then you really need to get your hands on these. Is it cheaper to brew your own beer? Yes, it’s cheaper to brew your own beer than to buy it in store. Even with a six pack costing less than $10, you can get a hell of a lot of grain, malts, and barley for that. You can still support your local craft brewery, but if it’s money that’s separating you and beer, then invest in a simple kit. Is all grain brewing cheaper? Yes, all grain brewing is cheaper than extract brewing. You can buy several pounds of grain, malt and barley very cheap, but extract and concentrates are significantly more expensive. How long does home brewed beer last? Home brewed beer lasts about 12 to 18 months on average. The higher the alcohol and hop content the longer it will last. But with most simple home brews being around 4% to 5% ABV they will be at their best for about 6 months, but perfectly fine to drink up to 12 months. How long does beer take to make? Beer takes about 4 weeks to make mainly dependent on the style and alcohol content you’re aiming for. The stronger the beer, the longer the fermentation process will take. For a basic brew, it will take about 2 weeks to ferment and 2 weeks to condition in the bottle. Is it easy to brew your own beer? Yes, it is easy to brew your own beer, and you don’t even need a ton of specialist equipment. With some basic gear and even simpler ingredients, you can have your first batch in a matter of weeks. Yes, beer kits expire, and you should pay close attention to the dates printed on the ingredients. Also, once you open the containers or bags, you will need to use them a lot sooner than the expiry date because the quality will deteriorate rapidly after that. How long will beer yeast last? Yeast generally lasts for about 2 years in dry form. Each pack will also give instructions on what the expected deterioration will be. For example, some dry yeast may be still usable after 2 years, but only contain 50% of the active culture. Can I reuse a home brewing kit? 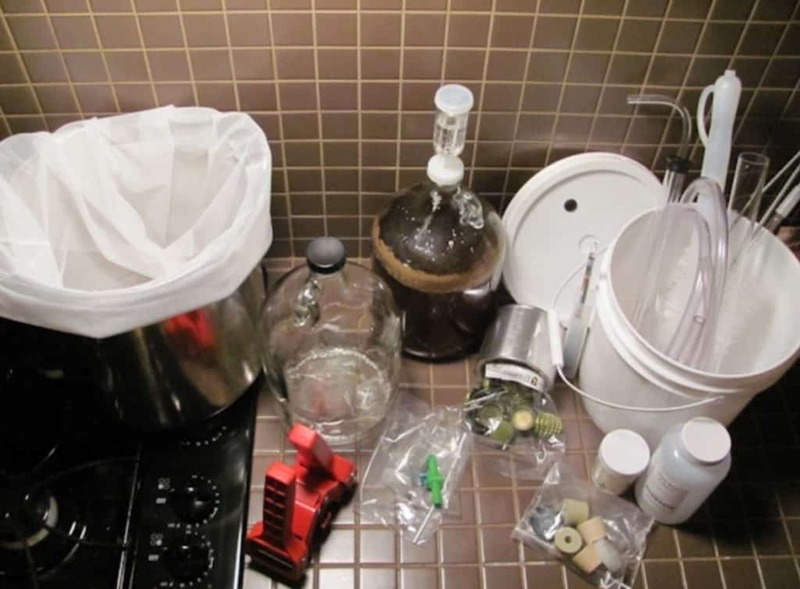 Yes, you can reuse a home brewing kit as long as you clean and sterilize it after each use. Most kits are designed to be used many times over, and there are very few things that you will need to replace over time. By spending a little extra for a kit that has glass materials, you will increase the number of times you can use it. What’s The Best Beer Making Kit? 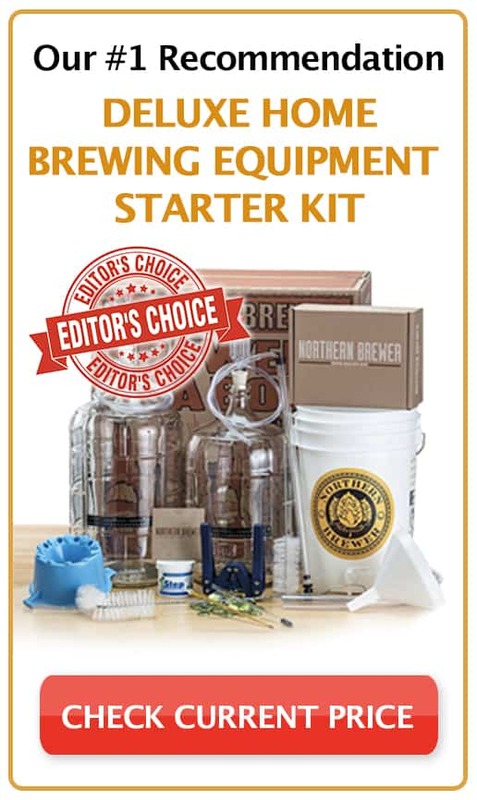 Personally, if you are starting out with nothing I recommend going with Deluxe Home Brewing Starter Kit manufactured by Northern Brewer. Considering everything that you get, it’s quite a good value. 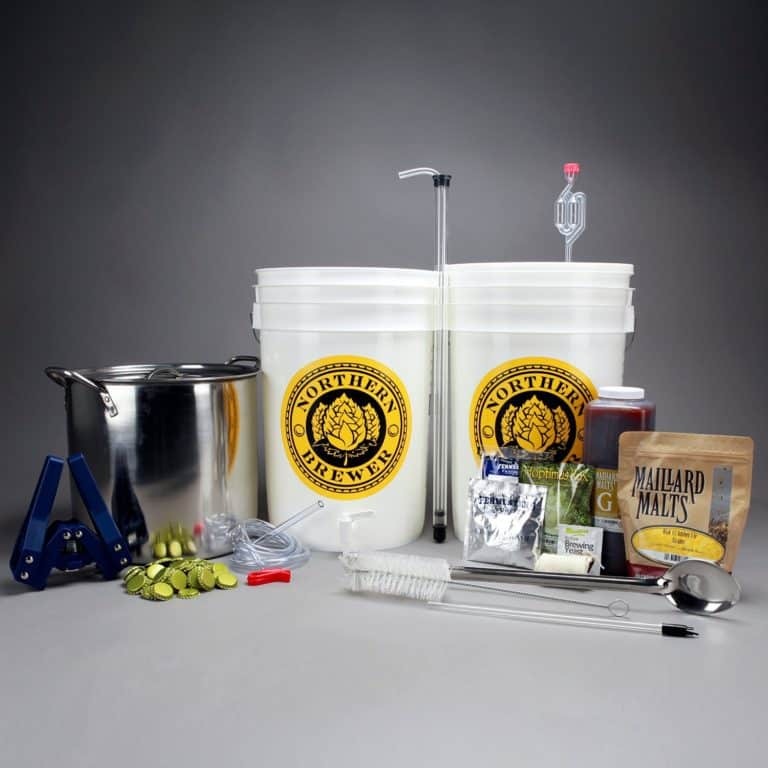 You won’t have to worry about missing a step with the instructional DVD, and you will be able to make your first gallons of beer at home with the IPA kit. The complete cleaning kit is a must in my experience, and you can also use the bottling bucket as a sanitation station. This beer brew kit covers all angles and provides you with the necessary tools to produce high-quality craft beers. Buy it from the trusted site down below.